EXAIR's compressed air operated Reversible Drum Vac System attaches quickly to any closed head 30 or 55 gallon (45 imperial gallon/205 liter) drum. Its high powered vacuum fills the drum in less than two minutes. With the simple turn of a knob, the same stainless steel pump quickly empties the drum. Coolant sumps can be easily refilled, floor spills vacuumed, or contaminated liquids transferred to filtration tanks in minutes. 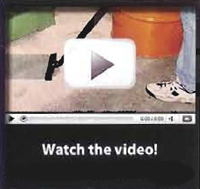 With the turn of a knob, the compressed air powered Reversible Drum Vac will fill or empty a 55-gallon (45 imperial gallon/205 liter) drum in 90 seconds. This two-way drum pump attaches quickly to standard drum connections. There are no moving parts to assure maintenance free operation. The flow rate in and out of the drum can be controlled with the knob, making it ideal for dispensing liquids. EXAIR's new Mini Reversible Drum Vac System delivers the same two-way action for small jobs. It comes complete with a 5 gallon drum and all the tools. NOTE: The Drum Vac System must be used with a closed head steel drum with a nominal wall thickness of 1.5mm (16 gauge) and in good condition. Warning: Do not use with any material with a low flash point or with flammable liquids such as fuel oil, alcohol, mineral spirits, gasoline or kerosene. 6196 55 GAL Reversible Drum Vac System - includes two-way pump assembly (1/4 NPT), shutoff valve, 10' (3m) flexible vacuum hose (1.5"/38mm I.D.) with 90° quick release elbow connection, (1) aluminum wand,(drum not included). 55 GAL Reversible Drum Vac System (Deluxe System) - includes two-way pump assembly (1/4 NPT), shutoff valve, 10' (3m) flexible vacuum hose (1.5"/38mm I.D.) with 90° quick release elbow connection, (1) aluminum wand, (2) extension wands, crevice tool, skimmer tool (drum not included). 6196-30 30 GAL Reversible Drum Vac System - includes two-way pump assembly (1/4 NPT), shutoff valve, 10' (3m) flexible vacuum hose (1.5"/38mm I.D.) with 90° quick release elbow connection, (1) aluminum wand,(drum not included). 6196-5 Mini Reversible Drum Vac System - includes two-way pump assembly, shut-off valve, 5 gallon container with lid and locking ring, 10' (3m) flexible vacuum hose (1.5"/38mm I.D.) with 90° quick release elbow connection, aluminum wand, spill recovery kit, (2) extension wands, crevice tool and skimmer tool. 6901 Spill Recovery Kit, includes one-piece 54" (1.4m) ABS wand and 14" (36cm) double blade squeegee tool.